I’ve written about this before, I know, but it makes me a little crazy when I see a Starbucks in a European country, like here in Germany. How is it that an American coffee institution that built its business around ersatz European coffee drinks with coffee that is almost always overroasted, gains any popularity whatsoever in the actual Europe? It is hugely popular. Always crowded. I do avoid Starbucks if I can, so I’m not entirely clear if it just draws American visitors. I think it likely attracts locals as well. So, when we were a little early for a lunch right inside the Brandenburg Gate in Eastern Berlin, we found ourselves in search of a cup of coffee. The only place at that particular location we could find was, yes I am sure you guessed it, a dreaded Starbucks. I dragged my feet as we neared the crowded establishment when lo and behold — immediately next door sat a German bakery and coffee establishment. There, I got a simple and delicious cappuccino. My friend got a hot chocolate with whipped cream on the top. And to top it off — a big ol’ pretzel with mustard. I am sitting in a Seattle-like San Fran coffee shop in Chelsea — enjoying my cup of coffee (with a name i cannot even pronounce) pondering why 5 oz of coffee beans would cost $25 — other than their name Geisha. You have to laugh to think of us, children of the percolator generation, getting all gaga over “drip” coffee. Hey, kids behind the counter, we used to call that Melitta! I can find the Pantheon in Rome practically in my sleep. That is, until I want to visit. I wander and wander and wander, and still no Pantheon. That’s often my experience when I travel: I hit upon my favorite places merely by happenstance. Several hours after my tortelloni lunch and a visit to another exquisite Caravaggio (Madonna of Loreto at the Church of Sant’Agostino), I figured it was time for the day’s dessert (likely instead of gelato — though maybe not. The day is, after all, only half done). 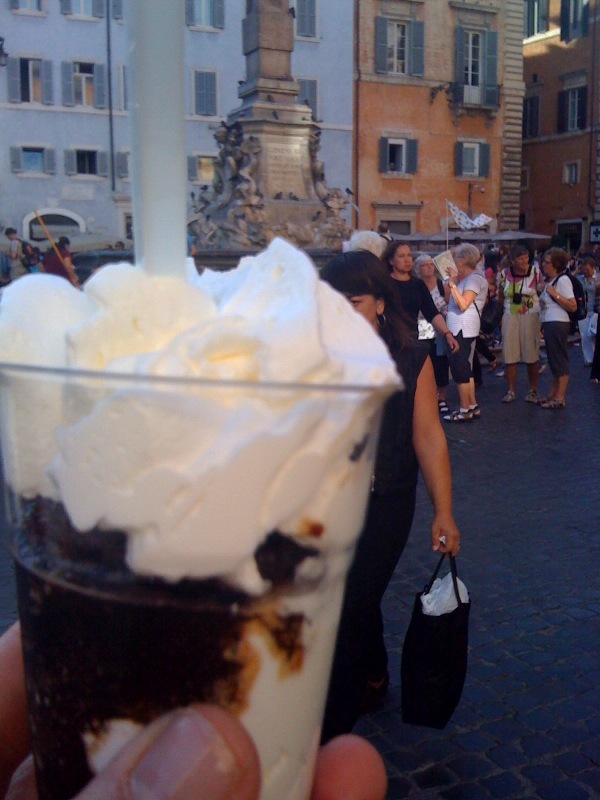 Anyhoo — the dolce di giorno was granita di caffé — from the Tazza d’Oro near the Pantheon. It is a sweetened coffee icey confection, layered with unsweetened whipped cream. I’m pretty sure when you read about the ambrosia of the Gods: this is It! I would go so far to say that if you had to choose (only under threat of death) between gelato and this heavenly iced dessert, you’d be better to choose the granita. You can always find good gelato in the States, but you have to come to Rome for the granita di caffé. That makes it a pretty expensive treat (air fare included).